The Bharatiya Janata Party (BJP) released its first list of 184 candidates for the 2019 Lok Sabha polls on Thursday. It said Prime Minister Narendra Modi will contest from his sitting seat of Varanasi, while party chief Amit Shah will make his Lok Sabha electoral debut, contesting from Gandhinagar in Gujarat. Other highlights were BJP announcing 28 candidates in Uttar Pradesh, replacing six sitting MPs, four of whom were on seats reserved for Scheduled Castes, which reflected the party’s concerns at the Samajwadi Party–Bahujan Samaj Party–Rashtriya Lok Dal alliance. In 2014, the BJP had won 71 of UP’s 80 seats, with ally Apna Dal winning two. In Chhattisgarh, the party declared candidates on five seats, replacing all five sitting MPs. It has already announced that it will replace all 11 candidates in Chhattisgarh. In 2014, the BJP had won 10 of Chhattisgarh’s 11 seats. The BJP has been disinclined to fielding leaders above 75 years of age. Senior leader L K Advani, the incumbent from Gandhinagar, refused to field either of his two children on the seat when BJP General Secretary Ram Lal met him in the morning. Advani has contested from Gandhinagar since 1989, barring 1996, when Atal Bihari Vajpayee had contested. Advani is 93 years old. Murli Manohar Joshi (85), the sitting MP from Kanpur, could also be denied a ticket. Kalraj Mishra (77), the incumbent from UP’s Deoria, tweeted that he would not be contesting. The candidates for Kanpur and Deoria will be announced later in the week. On other seats where seniors found themselves replaced, Tirath Singh Rawat will succeed B C Khanduri (84) from Garhwal. Khanduri’s son Manish recently joined the Congress, and is set to be the party’s candidate from that seat. Ajay Bhatt replaces Bhagat Singh Koshyari on the Nainital-Udhamsingh Nagar seat. Senior leaders like Nitin Gadkari and Rajnath Singh will contest from their sitting seats, Nagpur and Lucknow, respectively. Union minister Smriti Irani will once again contest against Congress president Rahul Gandhi in Amethi. In UP, the BJP announced 28 of the 80 candidates. It will not field sitting MPs in six seats – Shahjahanpur, Misrikh, Fatehpur Sikri, Hardoi, Sambhal and Agra. In Agra, it replaced former union minister Ramshankar Katheria with S P Singh Baghel, a minister in the UP government. In Badayun, UP legislator Swami Prasad Maurya’s daughter Sanghamitra will contest. In Rajasthan, the BJP announced candidates for 16 of the 25 seats. It has retained nearly all of its sitting MPs, but has replaced Jhunjhunu MP Santosh Ahlawat. It had won all 25 seats in 2014. In Odisha, Baijayant Panda, who recently crossed over from the Biju Janata Dal, will contest on a BJP ticket from Kendrapara. The BJP has announced some or all of its candidates across 20 states. It had held three meetings of its central election committee this week. In Maharashtra, the BJP announced candidates on 14 seats. Two interesting battles in Maharashtra could be in Nagpur, where Gadkari will face Nana Patole, who quit the BJP to join the Congress. In Mumbai North-Central, the party will field sitting MP Poonam Mahajan against Congress’ Priya Dutt. The BJP has fielded Sujay Vikhe Patil, son of senior Congress leader Radhakrishna Vikhe Patil, from Ahmednagar. Other notable candidates are Kiren Rijiju from Arunachal (West) and Tapir Gao from Arunachal (East) seats. Former governor S Rajasekharan will be BJP’s candidate against the Congress’ Shashi Tharoor in Thiruvananthapuram. Former bureaucrat Aparajita Sarangi will be BJP’s candidate from Bhubaneswar. In West Bengal, Babul Supriyo will contest from his sitting seat of Asansol against Trinamool Congress’ Moon Moon Sen. Chandra Kumar Bose will contest from Kolkata South, Rahul Sinha from Kolkata North, Dilip Ghosh from Medinipur, and Locket Chatterjee from Hooghly. 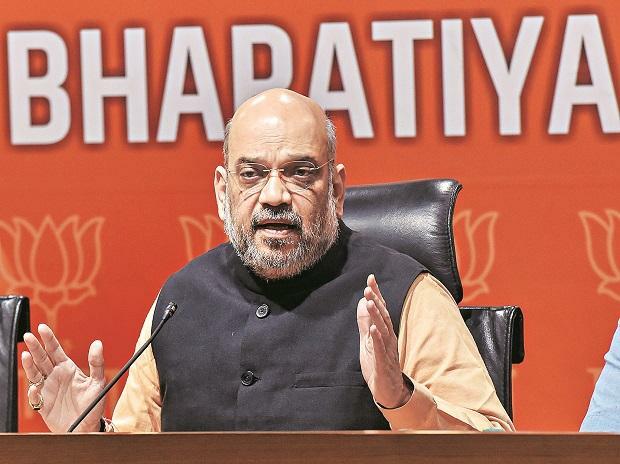 Party sources said the decision to field BJP chief Shah from Gandhinagar was to galvanise the party, which has faced anti-incumbency in recent times.